Nowadays, the wonders of artistic baking have gone beyond the limits of what my imagination can hold. Newbies or pros, there is no difference when showing amazing food presentations with the help of the best edible printer there is. I can say that with its help, I can say goodbye to art school and make equally creative cakes, cookies, and cupcakes with the edible graphics the printer can do. In no time, I could be selling cupcakes bigtime if I am not enjoying the little smiling faces of my cookie lovers at home. Are you familiar with edible printers? If you are new with this, you may not help but wonder how amazing inventors can be with this technology. However, it is true. 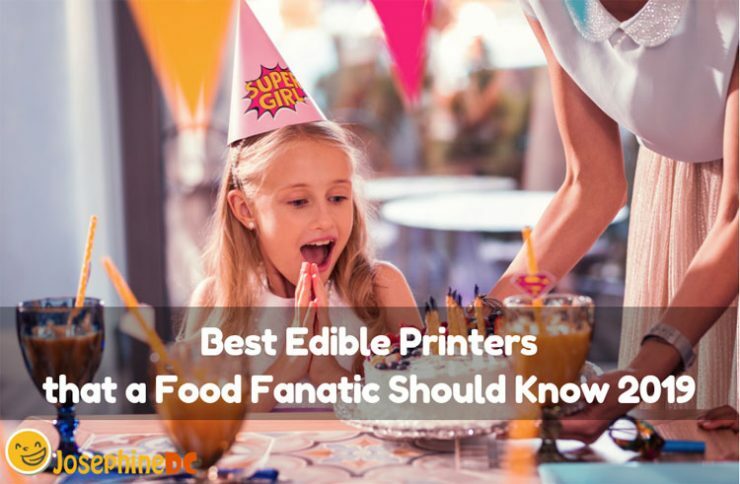 The best edible printers use ink cartridges that contain food-grade ink, which has the formula that especially suits the exact viscosity for an inkjet printer. The printer does the same function except that it ejects the ink onto an edible paper that is fitting to whatever baking art you desire to make. How does it work? After printing on frosting sheets (the most common edible paper), lay the printed sheets on top of a well-frosted cake. The sheets will easily absorb into the cake’s frosted surface showing behind the colorful images that you chose to print. It is quite superb and fascinating, making the existing technology a fad nowadays during parties and other special occasions where printed goodies add up on the fun and surprises. Edible printers create pre printed imageries out of colored edible inks onto your pastries, cookies, cakes, and other baked treats. Edible printers work the same way it does with existing ordinary inkjet printers and cartridges. Installation, ink sensors, and cartridge refills are just similar. Do you know how? Then, you can bake, print, and have a blast at the same time! If you are curious about how this printer really works, check out this short video tutorial made to guide you. If you are totally convinced on purchasing an edible printer, then my buying guide could help on choosing the right one for you. Especially for first-timers who are trying to acquaint with this technology for business or personal use, ending up with the best edible printer is vital. Here are factors that you need to consider when looking for one. There are two kinds of printers. One uses wafer paper while the other uses frosting sheets. Although the most sought after is the use of frosting sheets, you might want to learn about the wafer paper as well. Wafer Paper: Is of starch material and of course, utterly edible. As a downside, it is not capable of carrying hi-resolution images. Prints can only be with the same colors. Hence, it is only suitable for simple or singular prints like leaves, flowers, etc. If you are looking for a more sophisticated type of art, then wafer paper is not for you. Besides, wafer paper has this tendency to curl or wrinkle when frozen. It displays the same characteristic when the base is too moist. Since we are fond of placing our cakes in the fridge, do not be surprised if it happens. Lastly, take note that there is a possibility that your print may dissolve. Consider this when you are planning to have this for your party. Wafer papers have a smooth and a rough side. Remember that the smooth side is where the print should be. Cheer up! Do you know that wafer paper is best for cutting out different shapes? Yeah, tell that to your artistic kids. Frosting Sheets: You cannot actually consider these sheets like paper. They are made of sugar that you press together onto a plastic sheet for easy printing. Take off the plastic backing upon application on your cakes or cookies. Comparing to wafer paper, frosting sheets have a better resolution that allows you to print multi-colored images that do not dissolve in time. Is it user-friendly? You may want to request a demonstration of the unit you want to buy. It is essential to learn how to operate the printer. If you find it easy to use, then it is an advantage. Make sure that the ink is safe. Food authorities duly certify most of the edible printer inks circulating in the market. Be sure to choose one that is safe for ingestion. Maintenance: Regular maintenance is required for your printer. You are using this for baked foods that are for your family, friends, and customers. It is just right that it should be sanitary inside and out of the machine. Learn the proper procedure on how to clean it. If you are lucky, some manufacturers offer free maintenance within the warranty period. Check if you can ask for regular services as well. Warranty: When a product offers an attractive detail of the warranty, it makes me feel secure to buy it. I prioritize warranties that cover maintenance and machine parts replacements, if not the whole unit. It was difficult for me picking the right choice since it was completely new to me. I was scared to end up bringing junk at home. Plenty of new brands that I am not familiar with are available that got me confused. It was a big risk, and sort of a game of hit and miss. I suggest selecting a reliable brand if you want to be sure. There could be a bit difference about the price, but I tell you, it is all worth it. The build and design for a dependable product are necessary to take note of on top of other considerations. Do not forget to consider the compatibility of the software as well. Check out the best edible printer list in my reviews and see if you got one that you fancy. Maybe just like you and the rest of the printer users, I would be expecting three (3) important aspects upon my purchase. First, I expect that I can operate the printer with minimal technical guidance. The simpler the instructions and operation, the better. Next, the output performance of the unit must be exemplary. The images must be clear and vibrant in color. Picture quality must be high quality with no difficulty in reproduction. Lastly, I value excellent customer service. Unbelievably, I tend to choose the product that has sales and service people who genuinely show interest in helping and making my life as a customer stress-free. Now there is no need for you to fret if you are not certain what to choose considering numerous brands are offering edible printers. My collection of the best edible printer will narrow down your search for the most reliable one. Rest assured that the products in my reviews have proven their worth regarding of quality, price, and performance. It is impressive how Canon dominates the best edible printer market. I may present to you different reviews, but bottom line, Canon is all behind it. It is not a monopoly, but they just excel in quality and performance whatever the distributor and sales package are given. Hence, I will present to you Canon edible printers that offer different areas of expertise. I wonder what suits you best! PC Universal offers a bundle for an all-in-one edible printer, papers, and inks. The complete bundle guarantees sealed and brand new with free promotional economic shipping. Inclusive of the package is a free 90 days subscription of PC Edible Topper Online Design Tool. The software is easy to learn and use and has everything that you need to know about edible printing and decorations. You can create your own designs, save, and print. Yep, in just one click, you can print your own designs with PC universal frosting sheets and have fun creating your own masterpiece. Have fun to decorate different sizes of cakes, cookies, and other pastries as you please. The technology helps you develop your artistic side and do the edible printing like a pro! 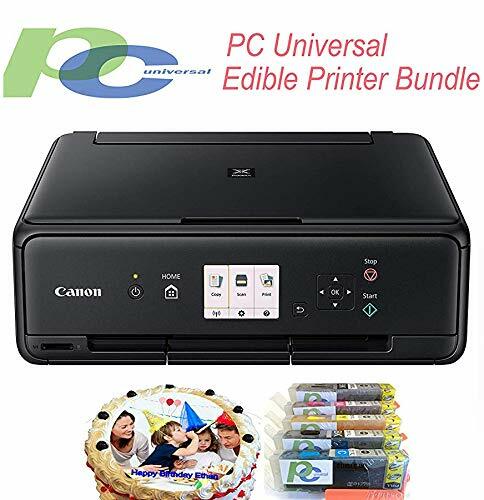 The bundle consists of one edible Canon all-in-one printer (Canon-Pixma-MX922), PC Universal XL size 270/271 edible and refillable ink cartridges (2 blacks; 1 red; 1 blue/cyan; 1 yellow; 1 magenta) and frosting sheets. You can use the printer and connect it wireless thru your desktop or phone. If you are dissatisfied with your purchase, PC Universal offers a 30-day return for full refund but is worthy to take note that the edible printer does not have support and warranty by Canon. However, PC Universal gives a one-year warranty for it. You can use it as a scanner and a copier. Some mentioned that the manual does not clearly state the instructions. Does not work well with wafer sheets. Mobile Deals are not behind with these trending bundles. Offering three-item bundle that consists of five edible ink cartridges (largely black, Cyan, Magenta, yellow and black), six edible sugar sheets (wafer paper), and TS6020 Wireless Canon edible printer, the deal is worth the price all over. Now you can print your artistic ideas/images to your birthday cakes and other tasty treats. The unit prints up to 8.5” x 11.69” striking and bright color images for your cakes, cupcakes and other creations as awesome toppers. The machine is compatible with sugar and wafer sheets, rice paper and chocolate transfer sheets as well. No need to say that it is safe and simple to use not only for business but also at home and even for kids. The package provides a CD disc and instruction user manual to guide you during the installation that includes the manufacturer’s documentation too. The edible Canon Pixma TS6020 printer features wireless connection and copy/scan function for your unlimited imaginations. You will be happy to know that Mobile Deals covers this purchase with a 30-day refund policy for the accessories and Canon manufacturer covers the printer with a one-year warranty. The printer design is not for batteries. You need to feed one sheet at a time. No doubt, that Icinginks is popular in edible printing. 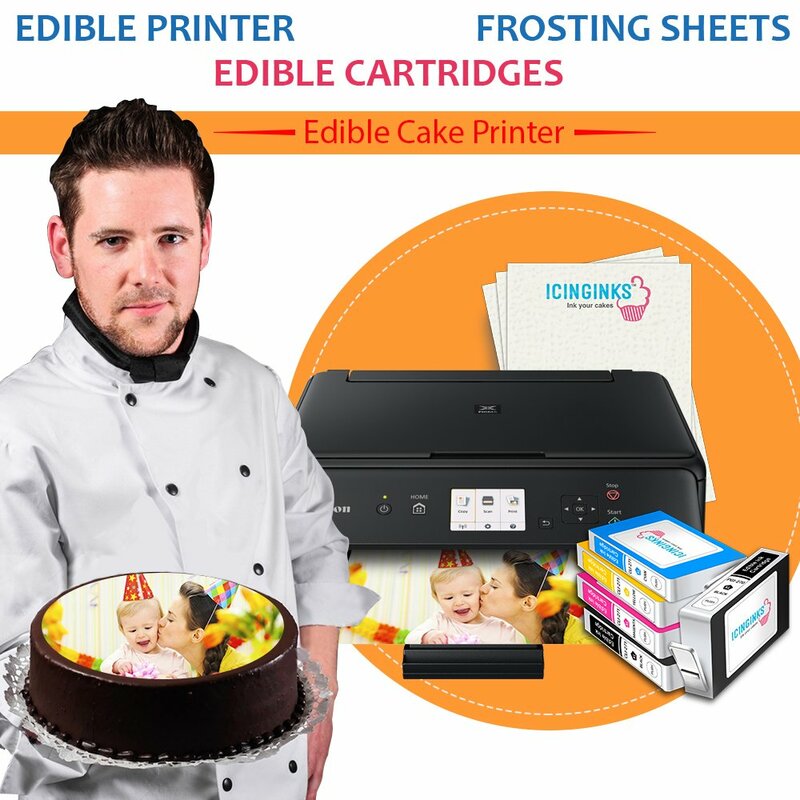 Check out their latest fast printing edible printer deluxe package offer that comes with the edible printer, premium 5-pack edible ink cartridges, cleaning cartridges, and edible paper. The Canon Pixma TS5020 top loader, back feeder edible printer produces vibrant, clear crisp edible images. Besides, the unit functions as a scanner too and can run wireless and compatible with your PC or mobile. The package also includes a set of cleaning cartridges to clean the printhead and get clear edible images every print without the troubles of streaking lines and dull colors. The refillable edible ink cartridges series CLI-271XL/PGI-270XL are already full with edible ink complete level, and you can refill it when needed. The model provides individual ink tanks for your convenience as well. Hence, if you run out of one color, you do not need to buy all colors along with it. Inclusive with 50 pcs of edible wafer sheets, instructional manual, lifetime free images editing, free designing support, and free technical services. The size of the printer does not take up a lot of space, easy to operate, fast and quiet to print. Some notes you need assistance to make the wireless connection work. Canon edible printers are leading in supporting edible printing for all creative minds out there that contributes greatly to enhancing baking art. 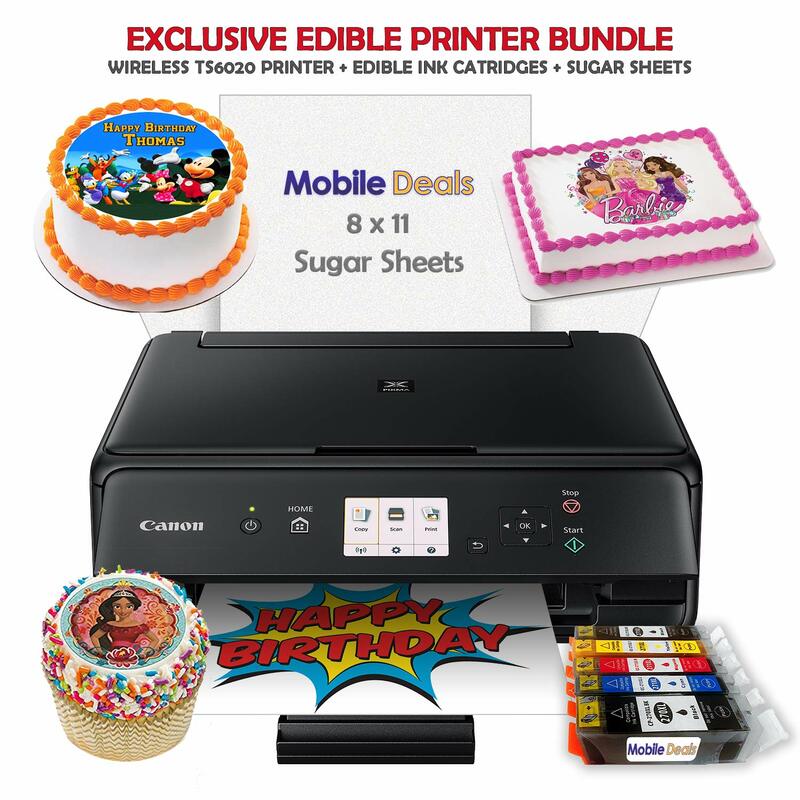 This time, the bundle includes Canon Pixma MG6821 Edible printer system, with all refillable ink cartridges, and 12-24 edible icing sheets. You can use the printer with sugar sheets, frosting sheets, icing sheets, wafer paper, rice paper, pizza edible sheets, and chocolate transfer sheets. The all-in-one printer prints images in vibrant color and clear crisps prints. Just the same, the high yield refillable edible cartridges Canon CLI-271/PGI-270XL comes with full edible ink (blacks, cyan, and magenta, yellow) and complete safety data sheets certificates. Just place your sugar sheets at the lower tray at the front of the printer and see the new print ejects above. The wireless printer that also functions as a scanner prints up to 8.5” x 11” images. Just download the Canon print app to your desktop or phone and learn from there. Designed to perform with edible prints at higher resolution, this unit comes with a one-year replacement warranty. It is loud when in use. Icinginks offers packages not only for newbies but for professionals as well. 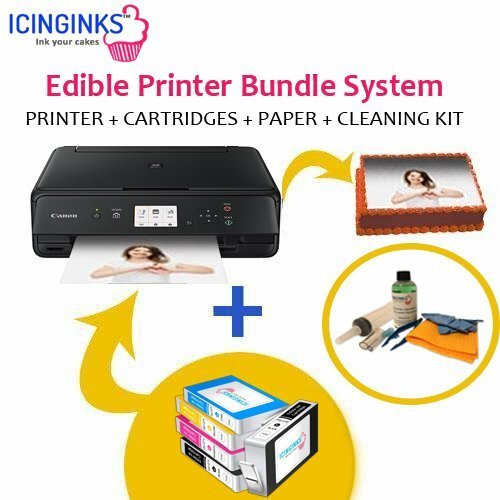 Check out the edible printer bundle system that also comes with newer model edible printer Canon TS8020 or TS6020 (if you prefer), refillable edible cartridges (CLI271XL, PGI270-XL), cleaning edible cartridges, refill edible kit (120ml of each bottle of 4 colors), 24 prime frosting sheets, injector refilling tools, instruction manual, and free lifetime image editing designing from Icinginks. The wireless printer that also functions as a scanner prints up to 8.5” x 11.7” size with the five (5) XL edible ink cartridges. The unit is compatible with frosting, icing, sugar, chocolate transfer, wafer sheets, and rice paper as well. 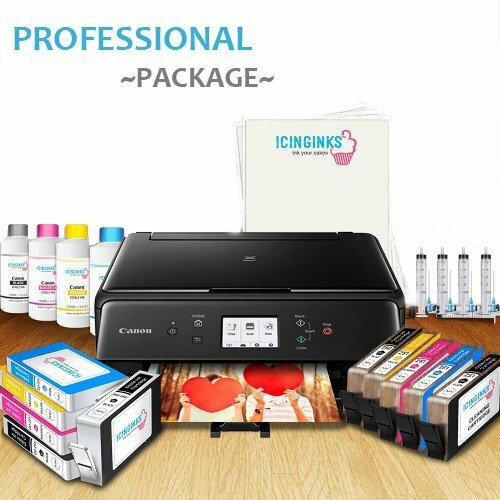 Unfortunately, Canon does not offer customer support for edible printing, but Icinginks brand provides 30 days refund policy, 1-year warranty, a lifetime of technical support and free edible photo designing. Canon does not offer customer support for edible printing. Canon brand is a reliable and trusted brand worldwide when it comes to printing. That is why it shows the highest ranking within the market especially when it comes to printers. However, they do not provide services for edible printers. Anyways, brands like Icinginks covers other services and warranties to assure the customers it is worth the purchase. Have you decided what printer model or bundle you want? Edible printing is fun especially when your passion is baking and organizing parties. Although this type of technology is more popular in the business world, it starts to penetrate the local market because of the reasonable bundle offers to promote edible printing. Good luck with your search! Related: Best Electric Oven for Baking of 2018: Buyer Guide and Reviews , This is the Best Silicone Baking Mat You Can Ever Get Your Hands .